Takes 25 Minutes , serves 6. Cook pasta as directed and use the cook time to prepare the rest of the ingredients. While the pasta is cooking, place a large skillet on the stovetop, set to medium-high heat. Drizzle olive oil into the pan and when it shimmers, add the chili flakes, turning them into the oil. Add the pancetta and garlic and sauté for 2 minutes. Add the mushrooms, toss the ingredients together and cook for 3 to 4 minutes. Add the peas, toss again and cook for 2 minutes. To serve: Transfer cooked pasta into a medium-sized bowl. Add the ingredients from the skillet and stir. Add 2/3 of the Parmesan, toss again and add pepper to taste. Transfer portions of the finished pasta onto small appetizer-sized plates. 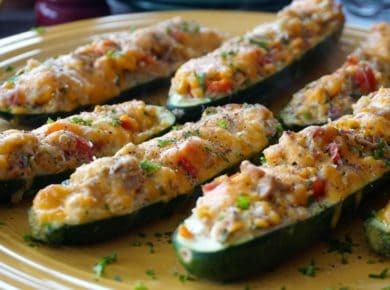 Garnish with additional Parmesan and pepper and serve immediately. An extremely tasty dish brought to you by the letter P! 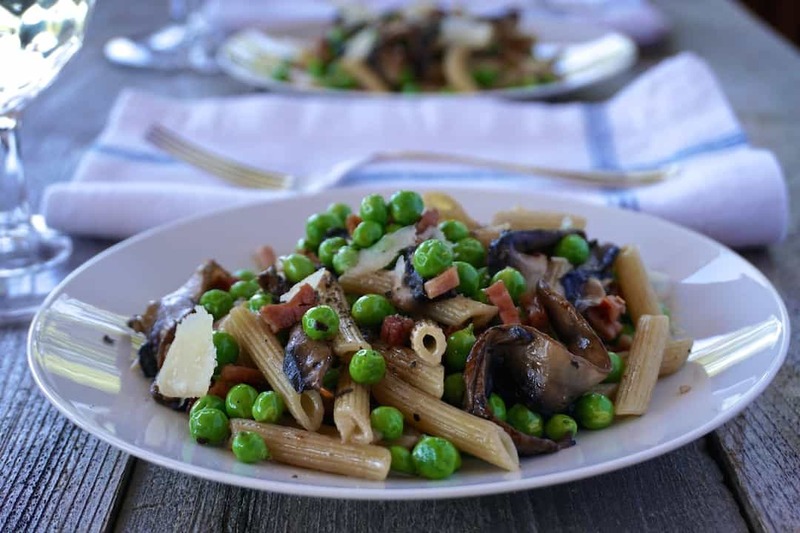 This PASTA WITH PANCETTA, PORTOBELLO AND PEAS is perfect! Faithful followers of Weekend at the Cottage know we believe great food always begins with choice ingredients, so we’re all for shopping local and supporting farmers. 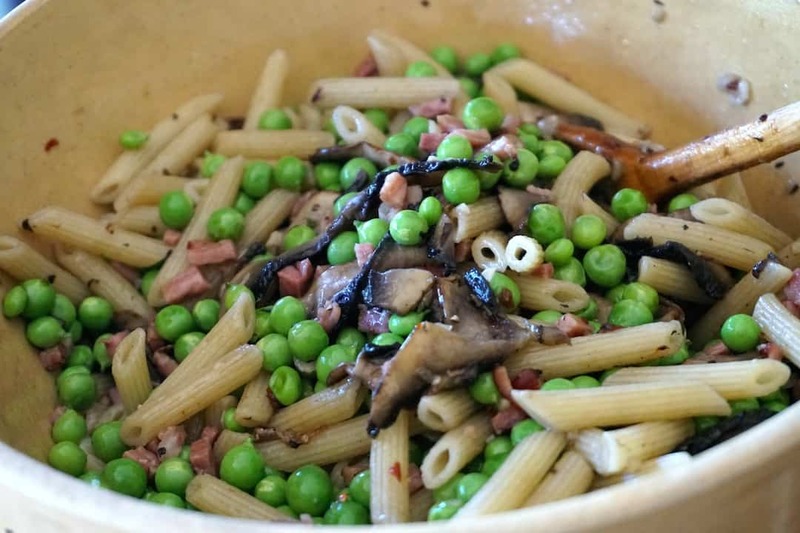 One of these trips to pick up some local ingredients resulted in this recipe for PASTA WITH PANCETTA, PORTOBELLO AND PEAS. My sister Maria and I decided to head into town to pick up a few essentials – candied nuts, licorice and (healthy!) chips. We made a quick detour to a favourite farm stand and were super excited to see quart baskets of freshly picked sugar snap peas, all laid out and looking awfully pretty. 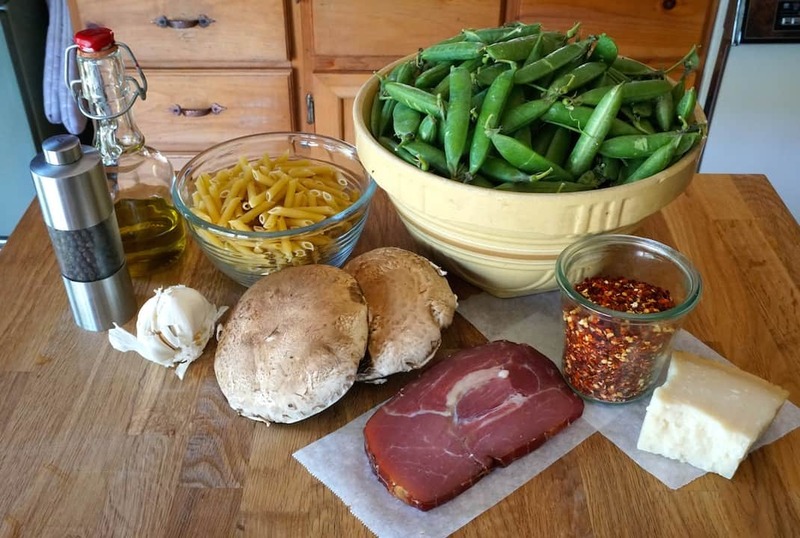 With fresh peas in hand, I simply ran with the idea of pasta made with other ingredients that begin with the letter P – alliterations work in writing, why not a recipe? The result is a pasta that is quick to make, easy on the eyes and tasty on the palette. 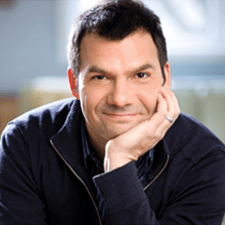 Here are a few tips on the preparation and presentation – more alliteration, I couldn’t resist! PASTA – I used a pennine rigate, which is a much smaller version of standard penne. I love this little tube-shaped noodle because it cooks quicker and is truly bite-sized. Look for it in the pasta section of your supermarket, and feel free to substitute the gluten-free version if you’d like. PEAS – I’ve kind of made a vow to only make this using fresh sugar snap peas. I always snap open a pod before I purchase them just to make sure they are filled with a run of plump peas. Shelling the peas is the only fiddly step in the preparation of the dish, but it’s well worth the effort – the taste is amazing. PANCETTA – We posted a PASTA PRIMAVERA a few weeks back and specifically crafted it for all of the vegetarians out there, so this recipe is made for those who enjoy a bit of meat. 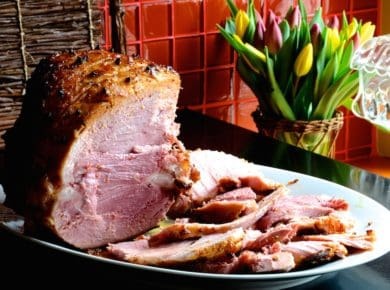 Using pancetta, a salted, cured Italian ham, gives the pasta texture and a rich flavour. 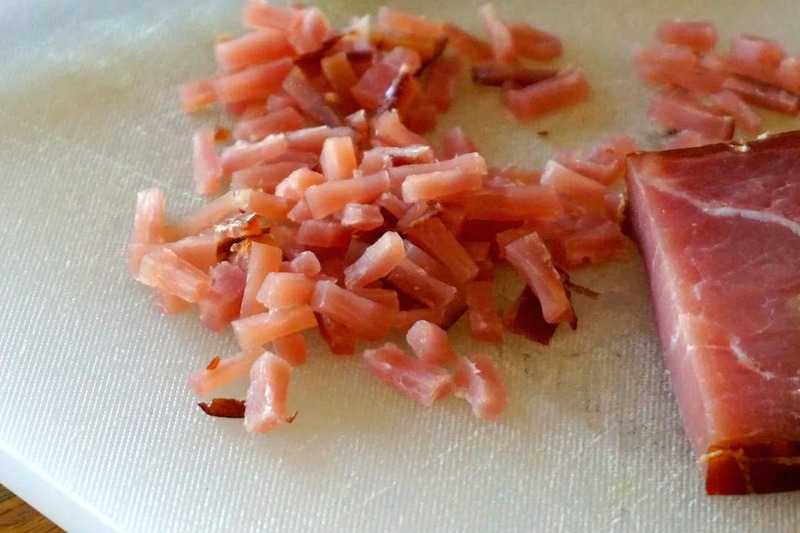 One thing to note, the sautéing of the pancetta releases quite a bit of salt, so taste your completed dish before seasoning; we even suggest refraining from adding salt altogether, letting the flavours of all the choice ingredients speak for themselves. 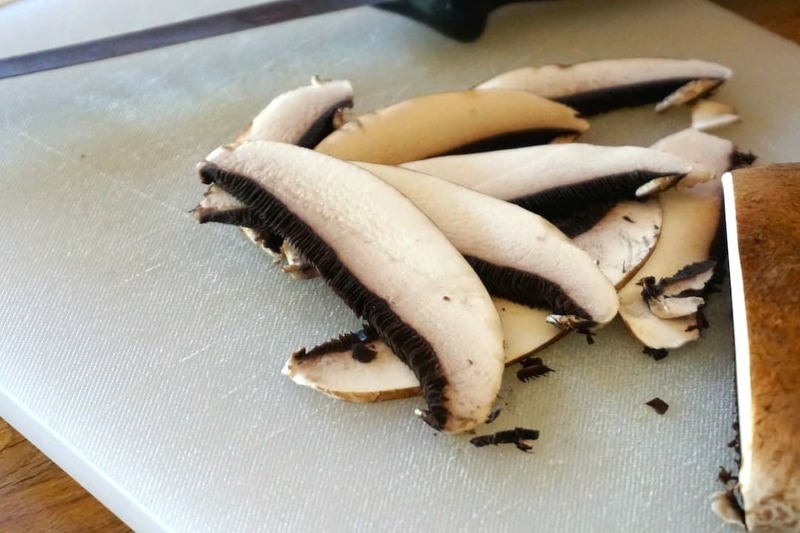 PORTOBELLO – The use of portobello mushrooms is about size and flavour. Slicing them into long, thin ribbons adds a luxurious look to the finished dish. And if you’re like me, you’ll notice that the bites with a morsel of mushroom are the most memorable. PARMESAN – This pasta really welcomes the addition of cheese, and Parmesan is IT. If possible, splurge and pick up an aged Parmigiano-Reggiano, adding shards into the mix before you toss and serve. Adding a few additional sprinkles on top as a garnish is also suggested. 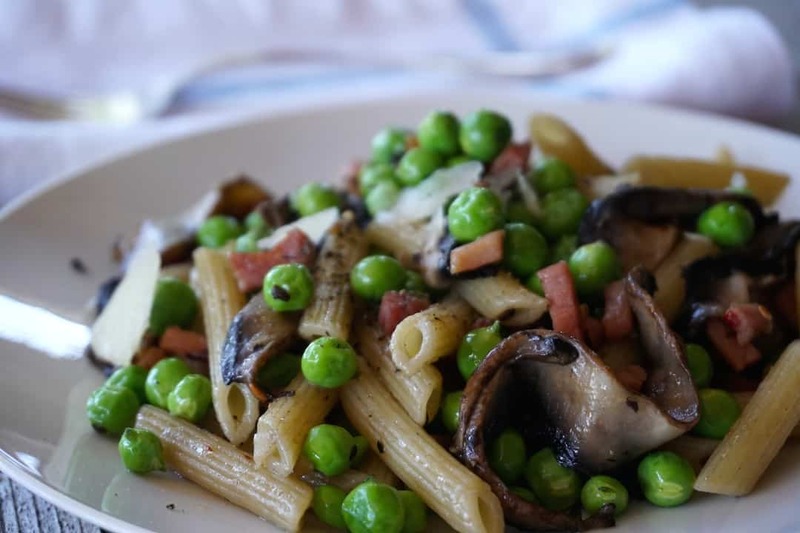 PRIMI – A final thought on our PASTA WITH PANCETTA, PORTOBELLO AND PEAS is about serving. When I started plating this dish, I remembered that it’s often served in Italy as a first course, referred to as primi. 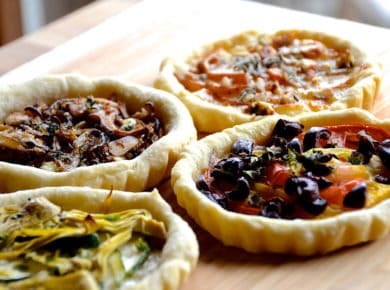 To serve in this fashion, portion size is reduced since it’s often followed by a more substantial main course, be it vegetarian, fish or meat. 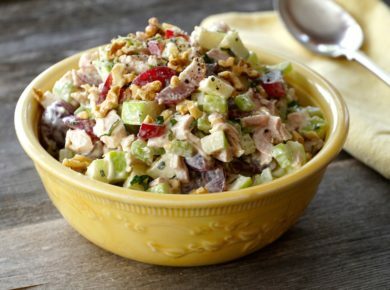 Keep our suggested way of serving this top of mind and prepare it as the first course for your next dinner party. You could follow it up with our MIXED GRILL or GRILLED WHOLE CHICKEN, presented with our SIMPLE SALAD. For dessert, something light and fabulous? Try our NO BAKE CHEESECAKE. 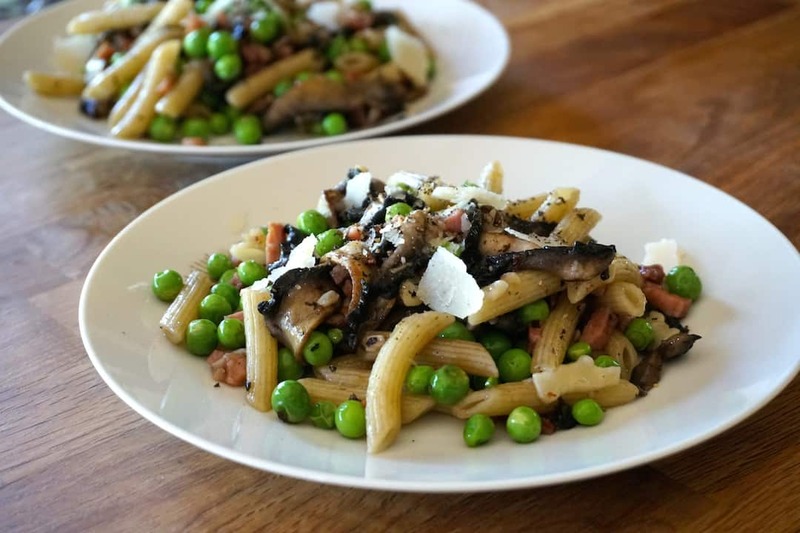 PASTA WITH PANCETTA, PORTOBELLO AND PEAS is pleasing on so many levels. 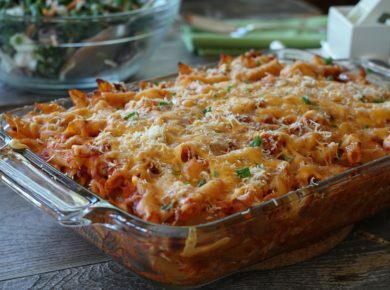 Isn’t it time you added a perfect pasta recipe into your culinary repertoire?